A perfect gift for your loved one, this ornamental clock, for practical use as well as decorative purposes. We are offering Marble Clock with Stand to our client. We are offering a wide range of Marble Products that are used in various applications in residential as well as commercial purposes. These products are manufactured from quality marble obtained from trusted vendors. 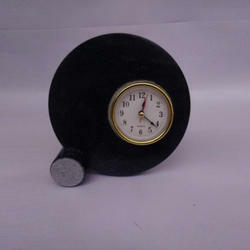 Fine Marble choki watch with pen holder, made by marble. hand painting work, and kunden meena stone work. We can meet the over growing requirement of our clients by manufacturing and supplying a comprehensive range of Marble Gold Painted Watch. Our organization can also facilitate our clients from all over the world by providing them many other products. We offer product at par with the internationalstandards. 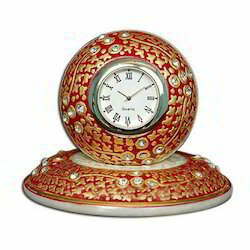 Create a beautiful traditional diwali gift hamper with marble Clock and greeting card. All things signify festive fervour & are useful in the traditional puja. The clock is made of pristine white marble & designed like a nariyal adding to the auspicious occasion.